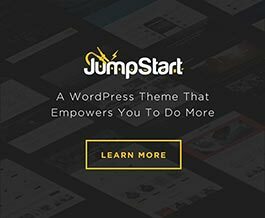 If you’ve built a fairly simple website using Jump Start or another Theme Blvd theme, you may find there’s scripts being included in your website that you don’t need. So it’s not a bad idea to tighty things up a bit and remove those. So the best way to tighty up unused assets is to use the themeblvd_global_config filter. You can read more about how that works here, but I’ll give you a snippet to start with here. Go through the following snippet and only keep the items, you know you don’t need. This might be tricky and may involve some trial and error. Remeber that the assets above may be different in different versions of the theme framework. So for the most recent list of available assets you can disable in the global configuration, see the themeblvd_setup() function in /framework/includes/general.php of your current theme. Note: One of the big things on the docket for Jump Start 2.2 and Theme Blvd Framework 2.7 is to better optimize how these scripts are included, in order to avoid including scripts you’re not using on a given page. From your child theme’s functions.php, you’ll de-register WordPress’s jQuery and swap it for the google-hosted version of the file. * Swap WordPress's jQuery for Google-hosted jQuery. If you’re including third-party scripts, often they’ll provide you both the minified and unminified versions. Make sure to download the the minified version, if possible, and enqueue that into your website. And when it comes to your custom scripts, you can minify those, as well. There are many tools online you can find to help you with that. If you really want to explore other options to speed things up, the W3 Total Cache plugin has a feature built-in that’ll compress scripts together into one file call, and minify them. You may run into hiccups with complex sites using a ton of plugins, but in general, this is a nice way to speed things up fairly significantly. This is extremely helpful in the WordPress system, because all theme and plugin authors should be enqueuing scripts into your site separately. This is important for WordPress system for handling scripts. However, when it gets to your final website, taking this extra step of optimization is your decision, and something you can choose to do for your final website.